BlogHome » Quilts and cakes – what a combination! 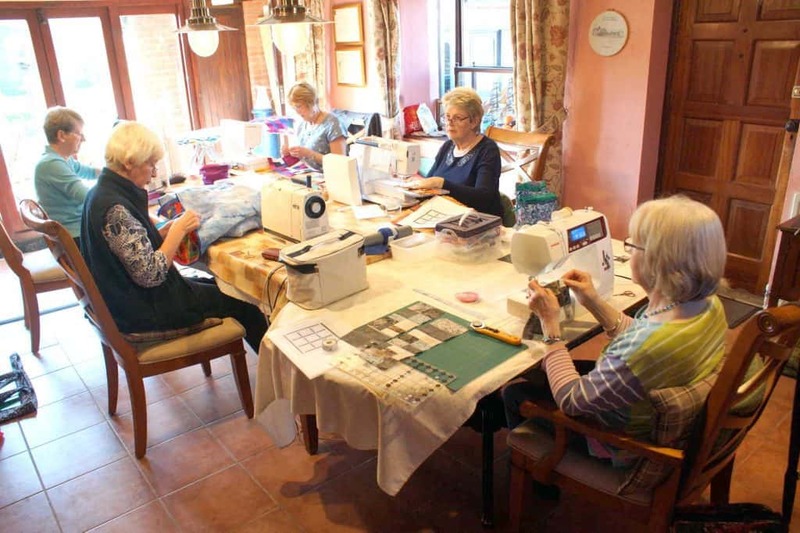 Imagine this; having the chance to sit and sew quilts with friends for a whole weekend, interspersed with lots of delicious, home-cooked meals and cakes to make sure you don’t go hungry! That’s what a number of groups of ladies have been doing over the last few months when we have hosted quilt retreats from a Friday afternoon to a Sunday afternoon. It’s amazing how much progress can be made on a project when you don’t have to pack everything away. Early birds can get some stitching done before breakfast or if you are a night owl you can continue after your evening meal. Hand stitching can be done in front of a roaring log fire in the lounge in the depths of winter but if the sun is shining as it was earlier this month on our last retreat, it was warm enough to sit outside and sew and also to have lunch outside. Groups of friends have worked on the same quilt design coming up with very different looks through their individual fabric choices. Others have brought their own projects to work on. Our last group of quilters were each working on a “puzzle” quilt from the Quilters Guild magazine and the finished quilts will be on display in an exhibition in the Autumn. We offer quilt retreats in our quieter seasons which are January to Easter and October. Faultless in every way. Thank you for making our stay so enjoyable. Thank you for a lovely stay. Excellent. Wonderful breakfast. Steve Wright, tired armchairs, Chocolates & Roses too….